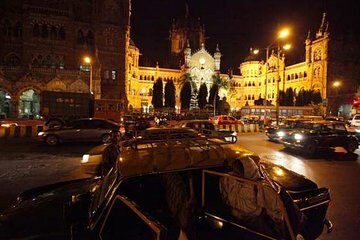 Testimone di Mumbai (Bombay) nel suo momento più magico in questo tour notturno di 2,5 ore dei monumenti illuminati della città. Assapora gli snack tradizionali nella vivace Chowpatty Beach, quindi visita il sacro Banganga Tank e attraversa il quartiere a luci rosse di Kamathipura. Scopri come Marine Drive si è guadagnata il soprannome di "Queen's Necklace" mentre guardi dall'alto in basso i punti di riferimento scintillanti dal Kamala Nehru Park, poi visita il Chhatrapati Shivaji Terminus, sito protetto dall'UNESCO. Questo tour per piccoli gruppi è limitato a cinque per un'esperienza intima. A great tour! We were able to go to a lot of places and our guide Jitu was really kind and knowledgeable. He answered all our questions and we felt safe at all time. Banganga tank, Jain temple, Victoria Terminus and the beach of Marine Drive are some of the few things you will discover. This was a good tour which was marred only by torrential rain - obviously this wasn't the company's fault! Guide and driver were friendly and - to their credit - accepted getting soaked as part of the package with no desire to rush us. Chowpatty beach was virtually deserted because the weather was so bad meaning this part of the tour wasn't as good as it would otherwise have been but was nobody's fault. The Jain temple was lovely and well worth seeing. Heard from our other tour guide the following day that Reality tours advertises as giving 80 back to the community - however our other guide said this wasn't true so be aware if this is your reason for choosing this trip. I have no idea what the truth is. All is all a good tour - was met promptly and had no complaints. My wife went on this evening tour and I pleased to say it was 1st class. The guide and driver were friendly, knowledgeable and gave us a very balanced and educational tour. The sites visited are varying but all worth seeing in their own way. Great value and I would thoroughly recommend. We were happy with the tour content and our tour guide, who went under the name G2 for ease.